Busy. Busy. Busy. That about sums up my life right now. It’s not like I am taking too much on. As I mentioned in a previous blog, I try to balance my life by not saying yes to everything that comes along, but some months or times of the year, there is just unavoidable busyness that makes life feel hectic. I am sure many of you can relate. From driving my son to and from school, buying groceries at the store, making decisions, attending birthday parties and baptisms, having family time, making dinner, cleaning and speaking, it seems like every minute of my day is accounted for. Then to top it off, my vision is still impaired and even though the glasses make it tolerable, it still adds a bit more stress to my life. I am firm on living life to the fullest, but sometimes it seems like my life is living me to the fullest! And, just when I was living in the hectic day to day, a friend mentioned a book she read. I bought it after she intrigued me with the summary. It is called One Thousand Gifts by Ann Voskamp and I am about half way through. I am not completely endorsing the book since I haven’t finished it, but I am loving its message and the author’s approach to communicating how to “dare to live fully right where you are.” We are all busy. Life is going to be hectic at times, but what do we do during those times to still fully live? We must become thankful. Not thankful for the busyness, but thankful for the little gifts and blessings that appear during the busyness. Like the white shine that comes from my children’s teeth when they laugh while they are screaming and running around the house playing. The dimple on my husband’s cheek when he grins really big. The way the light hits the roses during my normal watering routine. The softness in my mother’s cheek when I kiss her goodbye; the feeling of the warm sun beating down on me while pulling weeds in the front yard. I can’t stop the busyness or the craziness sometimes, but I can look. I can look around and take a second to be thankful for the things that normally go unnoticed. Just writing this short list of things I am thankful for makes me warm inside. It brings me joy. And, ironically enough it has invigorated me to look harder and enjoy better this wonderful life the Lord has given me. What have you noticed? What are you thankful for? Feel free to share in the comments. I would love to be inspired by what you see. As a side note: Below is a picture I wanted to share. I hope it makes you laugh! One day I was sitting on the couch and I took a break from the glasses and wore the patch. Ella came up and sat by me. 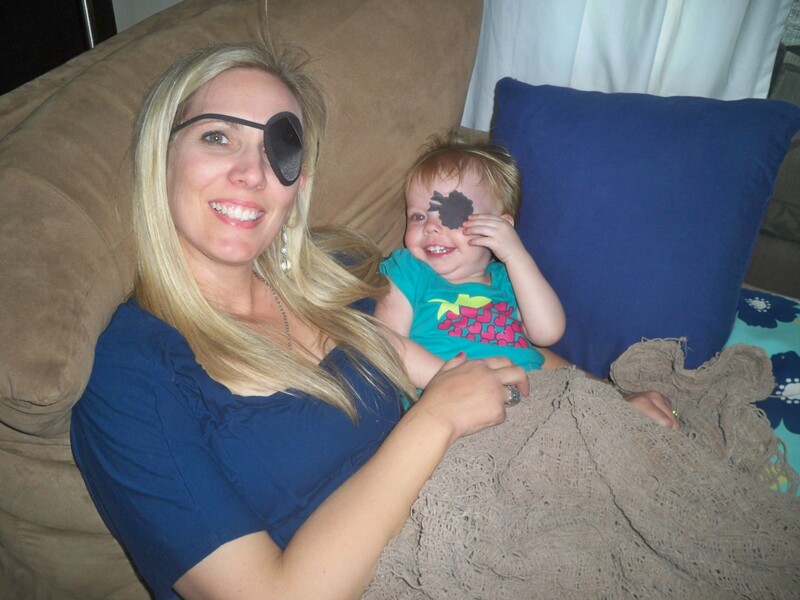 She had a magnet in her hand and then put it on her eye while giggling. she was trying to copy me. It made me laugh…oh the little things! 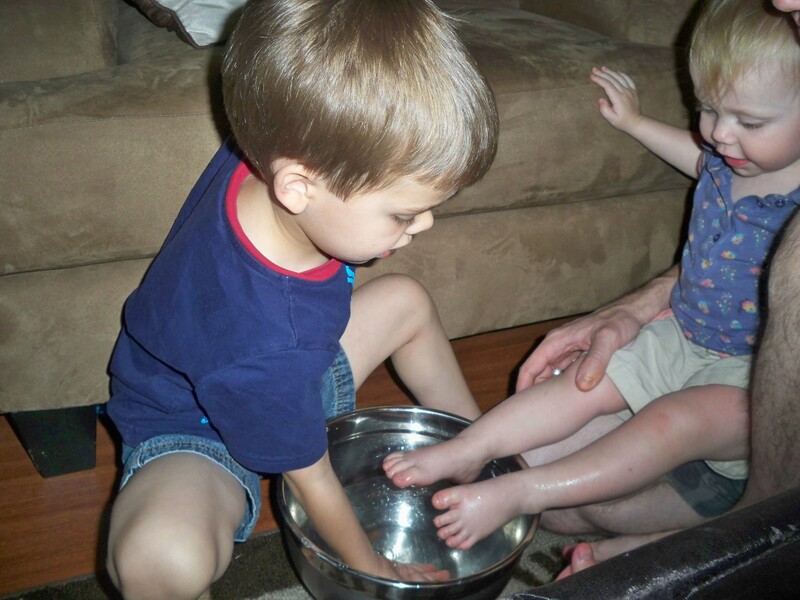 Last time I wrote about how we wash each other’s feet on Holy Thursday. Here is one of the special pictures I took a few weeks ago. Thanks Melanie for sharing, it made me smile and be thankful! I truly believe that I have the best job ever! As a Kindergarten teacher, I find so much joy in the things that “my kids” do and learn. The “look what I did”, “look what i wrote”, “look what I built”, “I sounded all the letter myself”. They are so proud of themselves and a lot of the things they have been doing we have taught them. (I say we b/c there are two of us teachers in the room). Plus they make me laugh all the time with the things that come out of thier mouths. ie: one little guy had these math links looped together and then though the sandbox lid which is quite heavy and he was trying to pull it down. When I asked him if he though he was making a safe choice he said, “no, but I was practicing my cowboy skills.” haha! !